Nikki and I catered another party last weekend. Another party, another request for a cocktail recipe — this time a spin on the oldest (and arguably coolest) of all cocktails — the Old Fashioned. A few months ago, Nikki and I made a trip to a local farmers’ market/co-op here in Orange County called the Ecology Center. Nik bought some lemon basil that smelled so delicious, I decided I had to use it in a drink as soon as I got home. Once I got it dialed, even Nikki said it was amazing — and she doesn’t even like bourbon. The crux of this drink is the lemon basil. There are a bunch of varieties of basil, and this one is a little harder to find, but if you love craft cocktails it’ll be worth the effort to dig it up. Throw 5 or so leaves of lemon basil in a glass with one Tablespoon (.5 oz) fresh lemon juice and one Tablespoon (.5 oz) simple syrup. Muddle the basil leaves in those juices. Be careful of the simple syrup. In an Old Fashioned, a lot goes a long way and you can ruin the drink with too much. Add 3 oz Basil Hayden’s bourbon and 2 dashes of citrus bitters. Lots of people make citrus bitters, but I use Boker’s Citrus Cardamom bitters. It is freaking delicious and really makes the cocktail really sing. For Orange County peeps, you can find it at a store called the Mixing Glass in the OC Mix. Or you can get info here. 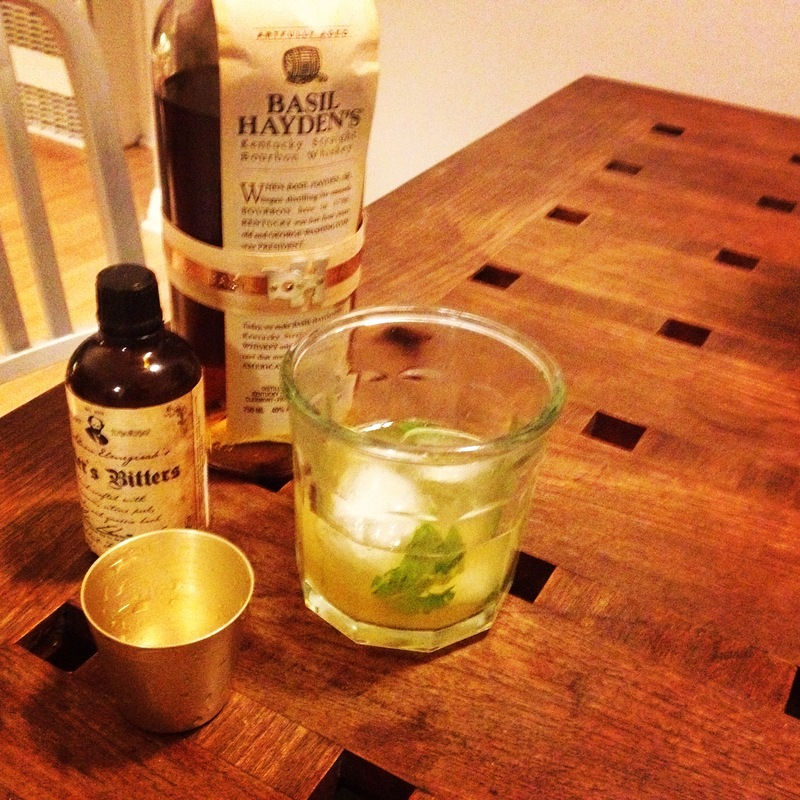 A note about the bourbon: Admittedly, Basil Hayden is pretty mild bourbon — and that’s exactly why I use it in this drink. In my opinion, a stronger, more traditional bourbon doesn’t play quite as nicely with the rest of the flavors here and tends to take over the cocktail. Lastly, add a few big rocks of ice and STIR very quickly to get things chilled and mixed together. A proper Old Fashioned is never shaken—only stirred. I usually stir a chopstick because those long bar spoons are cumbersome and I don’t really like them.